Digital Media Glossary InterMountain Record Center Society of American Archivists New York State Archives @ New York State Archives Glossary of Terms Wikipedia - the FREE online encyclopaedia @ Wikipedia: Glossary of Terms Federal Agencies Digitization Guidelines Initiative @ Glossary USAGE TIPS : To search for a term or details on this webpage press the “CTRL” and the “F” keys – at the same time; then type in the term or details you are searching for in the Find: search window box. On reviewing the information listed below related to this product you may find that you wish to request a Quotation for evaluation. If you require a written quotation then please Contact Us @ DME should you require a Quotation and we will respond to your request at the earliest opportunity. Additional input and additions to the above source material has been created and inserted by Laurie Varendorff ARMA – due to the dated nature of some of the information provided based on his 40 years experience in the microfilm, micrographics and microforms industry. In addition to the terminology provided on this page several of the National and International Standards Organisations provide, at a charge, more detailed lists of terms than appear in this listing. The Standards Organisation and the Document Number for their offerings, when available, are listed below. On reviewing the information listed below related to this product you may find that you wish to request a Quotation for evaluation. If you require a written quotation then please Contact Us @ DS & ME should you require a Quotation and we will respond to your request at the earliest opportunity. Additional input and additions to the above source material has been created and inserted by Laurie Varendorff ARMA – due to the dated nature of some of the information provided based on his 40 years experience in the Imaging – Microfilm - Micrographics and Microforms Industry. The standards organisations and the document number for their offerings, when available, are listed below. To quickly find a term, press the “CTRL” and “F” keys, and then type in the name of the term you are searching for in the Find: window. 16 mm microfilm: Roll Microfilm which is 16 mm in width & either 30.5 m – 100 ft or 61 m – 200 ft in length, commonly used to film office documents A 4 = 210 X 297 mm and up to A 3 = 297 X 420 mm in size via the use of either planetary or rotary cameras. See also: Planetary Cameras. See also: Rotary Cameras. 35 mm Microfilm: Roll Microfilm which is 35 mm in width & 30.5 m – 100 ft in length, commonly used to film documents larger than A 4 = 210 X 297 mm in size @ 7.4x Reduction and A 3 = 297 X 420 mm in size @ 10.5x Reduction and A 2 = 420 x 594 mm @ 14.5x Reduction, A 1 = 594 x 841 mm in size @ 21.2x Reduction and A 0 = 841 x 1189 mm in size @ 29.7x Reduction of engineering drawings, maps or plans and often used to film newspapers and other archival records via the use of large format planetary cameras. See also Planetary Cameras. 105 mm Microfilm: Roll microfilm which is 105 mm in width & either 30.5 m – 100 ft. or 61 m – 200 ft. in length, commonly used in the production of microfiche – 105 x 148 mm in size from digital data e.g. via Computer Output Microfilm – COM production. Also used to microfilm office documents A 4 = 210 X 297 mm and up to A 3 = 297 X 420 mm in size via the use of Step & Repeat Cameras. See also: Computer Output Microfilm – COM. See also: Microfiche. See also: Step & Repeat Cameras. 1. Fine hairline marks on the print or film surface that do not fully remove the image as does a scratch that penetrates to the base. 2. The defect in prints or film which results from moving contact with another surface. 3. Visible defects that result from rubbing the emulsion of a photographic material. 1: A collective name for Cellulose triacetate and Cellulose diacetate film bases. Acetate safety film was first marketed on a large scale in the 1920′s, due largely to a desire on the part of photographic manufacturers to sell 16 mm home movies that did not pose a risk of fire in balky home projectors or hot attics. Non-flammable plastic supports were obtained by grafting the acetate group – CH2COOH, or other similar organic acids, onto the cellulose molecule. The initial 16 mm cinema films – and some sheet film were made with cellulose diacetate that has an average of 2 out of possible 3 sites acetylated. Acetate base: Film with a base composed principally of cellulose acetate or triacetate is unsuitable for long term preservation. Deterioration of acetate base film generally occurs as a result of vinegar syndrome. See also AD strips. See also: Safety film – photographic. NOTE: After World War II, cellulose triacetate replaced nitrate in 35 mm motion picture films, as well as in x-ray and various roll films. Low flammability was achieved in all the acetate supports by virtue of the inherent nature of the side groups and by generous additions – 10 – 15 % by weight of fire-retardant substances known as plasticizers. Acid-free: An imprecise term referring to a substance having a pH value of 7.0 or greater. AD strips: Used to measure the rate of deterioration in acetate film base. Measurement may be carried out as part of a collection survey. Deterioration in acetate film generally occurs as a result of the vinegar syndrome. AD strips are produced by the Image Permanence Institute. Addressability: The number of addressable positions within a specified image, as follows: addressable horizontal positions by addressable vertical positions. Adhesive “REVERSE”: The aperture adhesive position in which the tape is on the reverse side and the tacky surface is toward the face – printed surface side of the card. 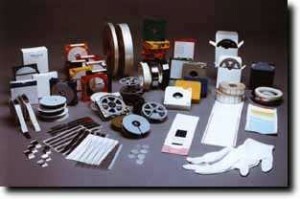 Adhesive tape: Paper, fabric or other material in roll or sheet form with an adhesive layer. The adhesive is generally activated by pressure, heat or water. Pressure-sensitive or sticky tapes should not be used for material intended for long-term preservation, since the adhesive degrades and yellows. AIIM – Association for Information and Image Management formally the – National Micrographic Association – NMA: A Maryland-based organization dedicated to promoting development of systems that store, retrieve and manage document images. 1. A phenomenon in which a sampled signal is degraded by false lower frequency components. Normally caused by sampling data at an insufficient rate. 2. Distortion of an image on a raster scan display caused when the detail of an image exceeds the resolution of the Cathode Ray Tube – CRT. Alkaline development: The process of developing a diazo material by bringing it in contact with an alkaline solution such as ammonia or an atmosphere of high pH, which promotes coupling of diazonium compound with a coupler to form a dye image. Alphanumeric: Pertaining to a character set that contains letters, digits, and usually other characters such as punctuation marks. Synonymous with alphameric. Ammonia process: The development of diazo materials by immersion in a concentrated atmosphere of ammonia. Anlog / Analogue: The traditional method of modulating radio signals so that they can carry information. Amplitude Modulation ( AM ) and Frequency Modulation ( FM ) are the two most common methods of analog modulation. Or representing data in continuously variable physical quantities, in contrast to the digital representation of data in discrete units ( the binary digits 1 and 0 ). Analog systems handle information which is represented by continuous change and flow, such as voltage or current. ANSI is a non-government organization that sets standards in the United States for voluntary use. 2. Coat the back of the film with a light absorbing material; 3) Introduce a layer of light absorbing dye between the base and the emulsion. Antihalation undercoat: A separate layer of light-absorbing dye located between the film emulsion and the base to suppress light reflection. During processing of this film, the dye layer becomes transparent. 2. An aperture in a microfilm reproduction system is a hole in an aperture card. 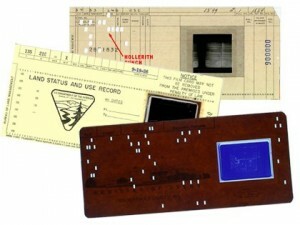 See also: Hollerith Card which is specifically designed to hold a frame or chip of microfilm of a specified size – ISO. Aperture card: 1: A card with a rectangular hole or holes specifically prepared for the mounting or insertion of microfilm therein. Aperture card: 2: The marriage of old-style IBM 80 column punch card and microfilm, micrographics and microforms on or about the 1940′s resulting in the term aperture card. A cut-out aperture area on the card contains a 35 mm – or sometimes a 16 mm or a combination of 16 and 35 mm microfilm, micrographic and microform image of a document, typically a blueprint or other engineering drawings, maps or plans creating the aperture card. Information about the drawing – such as the title, version, page, etc is punched into the card – in what is called Hollerith code and printed along the top. An aperture card scanner reads the punch data and scans the microfilm, micrographic and microform window. The result is a digital image similar to what is produced from a paper scanner. The punched textual information on the aperture card is often used to automatically index the scanned image, allowing unattended batch input of thousands of cards at a time. Aperture card use in Australia – New Zealand – Papua New Guinea & South Pacific is normally without the use of the Hollerith code being utilised. As strange as this media may seem, it is actually a compact way to store hundreds of thousands of engineering drawings, maps & plans that would otherwise take up warehouses full of paper blueprints. Another description is that of a card with a rectangular hole or holes specifically prepared for the mounting or insertion of microfilm therein. 1. Conventional Aperture Cards, are 82.5 mm x 187 mm = 32.248 x 7.362 inches in size pieces of card. From this card a square hole or aperture ( hence the name ) is cut, this hole is approximately 50 mm x 40 mm = 2 x 1 1/2 inches in size. The edges of this hole are lined with an adhesive tape thus allowing one frame of 35 mm microfilm to be positioned securely over the hole. This allows the light to shine through the microfilm image enabling it to be read. 2. Aperture Cards – For ease of identification, if you look at the aperture card with the cut corner in the top left, then an M1 card will have the adhesive tape on the rear of the card and the hole ( or aperture ) will be to the left of the card. When a frame of 35 mm microfilm is positioned onto the adhesive tape, the emulsion side of the film will be at the front of the card. Dimensions for the Aperture Card are 82.5 mm x 187 mm = 32.248 x 7.362 inches in size . 3. M4 Aperture Cards – For ease of identification, if you look at the aperture card with the cut corner in the top left, then an M4 card will have the adhesive tape on the front of the card and the hole ( or aperture ) will be to the right of the card. When a frame of 35 mm microfilm is positioned on to the adhesive tape, the emulsion side of the film will be at the rear of the card. Aperture card 3: Polyester Pocket Aperture Cards – These were very similar to conventional aperture cards in that they are exactly the same size. Instead of using adhesive tape to secure the frame of microfilm to the card, a polyester pocket sits in the hole ( or aperture ) of the card. The frame of microfilm is then placed inside the pocket. By far the most popular type of polyester pocket aperture card was the ‘MIL-D’ card. The ‘MIL-D’ card held one frame of 35 mm microfilm. This card was traditionally buff in colour but was available in salmon, white, red, green, yellow and blue by special order. 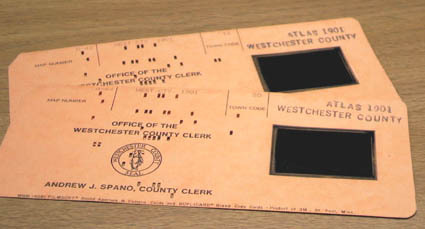 These cards were also available in a translucent card to enable both the microfilm and the written information to be copied at the same time. Polyester pocket cards were available in a wide variety of formats to store varying quantities and combinations of not only 35 mm but also 16 mm frames and strips of microfilm. Below are details of only a few examples of the entire range that was available. D-1635 ONE – 1 x 35 mm plus 6 or 8 x 16 mm, D-618 THREE – 3 x 35 mm, DBL-D TWO -2 x 35 mm, TJ-300 TWENTY FOUR – 24 x 16 mm. Polyester pocket cards were also available in A 6 = 105 mm x 148 mm. Some examples are MIL-D 105 ONE -1 x 35 mm, M-4518 FORTY EIGHT – 48 x 16 mm, M-3516 TWO – 2 x 35 mm plus TWELVE -12 x 16 mm. Note: Apart from the ‘ MIL-D ‘ card, all other polyester pocket cards were only available in buff or translucent card. Archival Quality 1: The degree to which a processed print or film will retain its characteristics during a period of use and storage. The ability to resist deterioration for a lengthy, specified time. A broad term relating to the ability of an item to retain its original characteristics permanently, or the ability to resist deterioration. In United States standards the use of this term is no longer encouraged. The more precise term, life expectancy = [ LE ], is preferred. Archival Quality 2: An imprecise term suggesting that a material, product or process is durable, and / or chemically stable, and that it has a long life and can therefore can be used for preservation purposes. The phrase is not quantifiable; no standards exist that describe how long an ‘archival’ material will last. Another description is that of the degree to which a processed print or film will retain its characteristics during a period of use and storage. The ability to resist deterioration for a lengthy, specified time. The word ‘ permanent ‘ is sometimes used to mean the same thing. Archive Writer: A device for converting Digital Data & Images to an Analogue Long Term Archival Media MICROFILM. 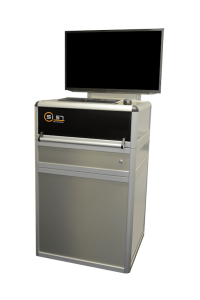 Automated retrieval: A microfilm, micrographic and microform retrieval system in which the image / s is displayed automatically. Commonly the user interrogates and index, which may be manipulated by a computer, to locate the image / s.
via an automated or semi-automated scanning, digitising & imaging device. A microfilm, micrographic and microform automated or semi-automated scanning, digitising & imaging system which scans from microfilm – 16 / 35 mm roll film or 16 mm ANSI cartridges, microfiche or aperture cards and produces a digital image [usually in a .TIFF file format] of the information held in a frame on the microfilm – 16 / 35 mm roll film or 16 mm ANSI cartridge, or microfiche or aperture card. Some of the more noticeable manufacturers are – Staude MULTI-FLY, Wicks & Wilson, Mekel, nextScan, Sunrise and others. 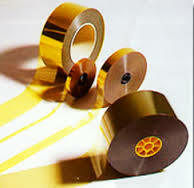 Base: Polyester, acetate or nitrate substrata film layer upon which the film emulsion is coated or embedded. Base Density: The optical density of a film base. Since no plastic is 100% transparent, all films have some density. The base density does not include any density produced by the emulsion layer. Base – film: The transparent plastic on which the photographic emulsion is coated. Base Fog Density: The density of the unexposed area of the film (the clear film). See also Density. BCD – Binary Coded Decimal Notation: Positional notation in which the individual decimal digits expressing a number in decimal notation are each represented by a binary numeral, e.g. the number twenty-three is represented by 0010, 0011 in the 8-4-2-1 type of binary coded decimal notation and by 10111 in binary notation. Bibliographic: see Bibliography Bibliographic integrity: see Collating Bibliography: A systematic list of information which helps to identify publications and other resources, e.g. author, title, date, publisher, volume. The term, bibliographic relates to the systematic description of items. 2. Lateral spread or diffusion of a dye-formed image. Bleed-Through: An effect caused when ink or paint has migrated from the surface of one side of a sheet of paper to the other side. This is generally due to the porous nature of the paper. See also Show-through. Blemish: A microscopic spot which may appear on microfilm and is usually reddish or yellowish in colour, sometimes termed aging blemish or microscopic spot. The National Bureau of Standards Handbook 96 tabulates 6 blemish classifications. Blips – Microfilm 16 / 35 mm: The exposure ( dark ) marks ( usually exposed film created ) placed on the microfilm by the camera predominately rotary cameras ) to mark each one of the up to several thousand exposures on a roll of 16 mm film. 1. Large - To designate batches of files. Book Carriage – Book Holder: A device which permits the rapid photographing of large bound books. The carriage has balanced, pneumatic, electric controlled or spring loaded platens so that two pages may be photographed at a time. Book cradle: Equipment used to microfilm bound volumes. The cradle flattens pages to increase sharpness and reduce shadows during filming. Brightness: The balance or contrast of light and dark shades in an image. Colored paper can produce different brightness levels in an image. Browsing: The quick examination from one frame to another on a reader or reader / printer or scanner screen. 4. Piling up of film in a camera, cassette, jacket or magazine due to a film-transport malfunction. Camera – Planetary – FLAT-BED: A type of microfilm camera in which the document being photographed and the film remain in a stationary position during the exposure. The document is on a plain – a flat or level surface at time of filming. See also: Camera & Planetary Camera. Camera – Rotary – FLOW: A camera in which original passes around a drum in synchronous motion with the movement of the microfilm. Camera – Step & Repeat: A camera used for producing microfiche. Camera Microfilm: First-generation microfilm. Also called the Master Film. Camera negative: Microfilm used in a camera to produce an original roll of microfilm. For permanent records the camera negative must have a silver gelatin emulsion to ensure longevity of the film. To minimize damage to the microfilm, the camera negative should only be used to produce user copies of the microfilm. Camera original microform: The microfilm that comes out of the camera, as opposed to the microform created by duplication. Can: A metal container used in packaging, transporting, and storing films. CAR System 16 mm Microfilm – Computer Assisted Retrieval System 16 mm Microfilm: An automated system that uses a database in conjunction with the reading of ” blip ” marks on each frame of 16 mm & in limited instances 35 mm roll microfilm to speed retrieval of documents, files, and or batches of information stored on roll microfilm. Card – Master Data: A tabulating electric accounting machines – EAM card containing punched information – non aperture. Also know as Unit record equipment. It is used in electric accounting machines – EAM machines to transfer the punched information or verify information in apertures, copy or image cards. Carriage: The table or stage on a unitised microfilm, micrographic or microform reader or reproduction device that holds the microfilm, micrographic or microform. 5. Dedicated 16 mm cartridge carrier for 3M or ANSI clip type. 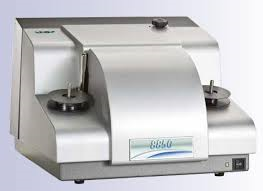 NOTE: Roll film and cartridge carriers are available with either manual or motorised drive mechanisms. The most commonly used 16 mm cartridges are the 3M – Minnesota Mining and Mineral Corp and the ANSI clip type. 35 mm cartridges are very rare and are seldom used today. 35 mm cartridges – the clip type were previously supplied by Kodak. 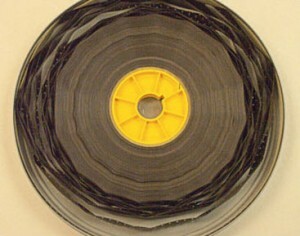 Cassette: A plastic double-core container for 16 mm microfilm which encloses both the supply and the take-up spool or reel in a single housing not dissimilar to VHS tape cartridges. 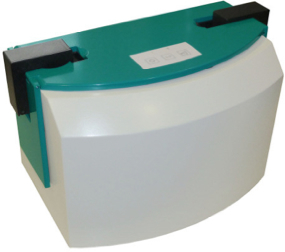 This form of microfilm, micrographic or microform container has been out of popular use in the microfilm, micrographic or microform industry for many years and will not normally be encountered. Cathode Ray Tube – CRT: The Cathode Ray Tube – CRT is the heart, soul, and guts of any standard television set. The CRT is the picture tube used in all television and monitor sets that require a scanning tube. In a CRT, “Cathode” is the device used for creating negative charged electrons, “Ray” is the beam of electrons shot toward the display screen, and “Tube” is the glass vacuum that houses the device. CD, CD-R, CD-RW: These terms refer to the 120 mm = 4 ¾ inches read-only compact disc (CD-ROM). CD’s are faster and more accurate than magnetic tape. CD’s in all their variations are accessed by a laser – based reader and hold just over 600 megabytes of data. CD’s, DVD’s, and 12” laser ( video ) discs are forms of Optical Discs. Cellulose triacetate: Transparent plastic previously used widely – 1920 – 1980 as a film base because of its transparency and relative non flammability. Certification: A process by which the camera operator and the records custodian document that the microfilm, micrographic or microform reflects true copies of the records microfilmed. Following set certification procedures ensures microfilm, micrographic or microform will be admissible in court or administrative proceedings. Channel: The space in a jacket into which the film is inserted. Chip: A piece of microfilm, micrographic or microform that is smaller than a microfiche. Chromatic aberration: A lens defect that causes rays of light of different wavelength to focus in different places. Cinching: Pulling film tight when wound on a reel. COLD – Computer Output to Laser Disk: Microfiche replacement system. COLD systems offer economies as a replacement medium when rapid and / or frequent access to archived documents is necessary. Typically, a 12 – inch Optical Disk Platter holds approximately 1.4 million 8.5 by 11 inch or A 4 = 210 x 297 mm size pages of information, equal to 7,000 fiche masters. Later COLD media were CD-R & DVD-R.
Colour stripe: A colour – or colours placed at the top edge of the heading area of a jacket, aperture card or microfiche; used for identification and retrieval. Column: A vertical series of images on a microfiche or micro-opaque card. Combo carrier or combined carrier: A carrier either manual or motorised which combines the ability to accommodate 16 and 35 mm roll film, aperture cards, microfiche, jackets and in some instance 3M 16 mm cartridges. Comic mode: Images arranged on microfilm, micrographic or microform from left to right like a comic strip. Computer Assisted Retrieval System 16 mm Microfilm - CAR System 16 mm Microfilm: An automated system that uses a database in conjunction with the reading of “blip” marks on each frame of 16 mm & in limited instances 35 mm roll microfilm to speed retrieval of documents, files, and or batches of information stored on roll microfilm. Computer Input Microfilm: The process of reading data contained on microfilm, micrographic or microform by a scanning, digitising & imaging device and transforming the data obtained into a form suitable for a computer to digest. This definition of 1982 is now dated as this process is now in day to day usage with digital microfilm, micrographic or microform Reader / Printer / Scanners – which are the digital alternative to the now obsolete analogue reader / printer. See also: Digital microfilm Reader / Printer / Scanners. Computer Output Microfilm – COM: Microfilm, micrographic or microform containing data produced by a recorder from computer-generated electrical signals. A computer output microfilmer is a recorder that coverts data from a computer into human-readable language and records it on microfilm, micrographic or microform. Microfilm, micrographic or microform produced directly from a computer file to microfilm, micrographic or microform. COM produces high quality microfilm, micrographic or microform, often in microfiche format. Condition of records: Refers to the variation in size and color of paper records, number of folded or stapled pages, and the number of pages per chart. These variations can impact processing speed and quality. Contact printing: A method of copying in which the raw stock is held in contact with the film bearing the image to be copied. This is the process used in the duplication of microfilm, micrographic or microform of all types. Container: A generic term for boxes, cans, cartridges, magazines, and cassettes or other structures for enclosing microforms. Continuous – tone copy: Photographic copy that contains a varying gradation of gray densities between black and white. 4. Vesicular films: processing by heat. 2. An unflanged cylindrical form on which film or paper is wound. Coverage: The portion of the document included in the lens field. Curvature of field: The aberration of a lens that causes the image of a plane to be focused into a curve instead of into a flat focal plane. Definition: Distinctness or clarity of details in a photographic image, microfilm, micrographic or microform image, or enlargement. Densitometer: A device used to measure the optical transmittance or reflectance density of an image or base by measuring the amount of incident light reflected or transmitted. A measuring instrument that registers the density of transparent or reflective materials. It is used to check the accuracy, quality, and consistency of output. Colors are read as tonal information. Dense: Relative opaque, generally applied to film or an area of an image that is darker than normal. Density: Measures the contrast between the image and the non – image background of the film in the case of microfilm formats. In addition density can refer to the degree of darkness in an image & also the percentage of screen used in an image. Colored paper or inks can produce different densities in an image. The ability of a material to absorb light. Measure of the light transmission of a transparent or translucent object or the light-absorbency of a reflective surface. In photography, measurement of the opacity of a transparent or translucent object. On a film negative, the greater the density area, the more black or more developed it is. Density is measured from 0 to 4.0. It is calculated by measuring the reflectance or transmittance of light and calculating theoretical light absorption. Develop: To subject to the action of chemical agents or physical agents – as in electro photography for the purpose of bringing to view the invisible latent image produced by the action of radiant energy – e.g. a light source on the sensitised surface. Developer: A chemical reagent used to produce a visible image on an exposed photographic layer. Developer may take many forms for different materials, such as conventional formulas for silver emulsions; plain water used to develop blueprints; or a gas, such as ammonia vapour, used to develop diazo films and prints. Diazo Film – 1: A slow print film, sensitized by means of diazonium salts, which, after exposure to light that is strong in the blue to ultraviolet spectrum and after development, forms an image. Diazo film generally produces non reversible images, i.e., a positive image will produce a positive image and a negative image will produce a negative image. Diazo Film – 2: A photographic film containing one or more photosensitive layers composed of diazonium salts in a polymeric material which react with coupler / s to form an azo dye image after film processing. NOTE: Couplers are contained either in photosensitive layer / s or in the processing solution. The colour of the image is determined by the composition of the diazonium compound and the coupler / s used in the process. Diazo film gives polarity identical to that of the original – ISO. Diazo microfilm: Microfilm, micrographic or microform used to create user copies of master microfilm, micrographic or microform. This polyester based film is ideal for everyday use because of its strength and high quality image. Diazo film has an average life expectancy of 50 years e.g. LE 50. Dichroic mirror: A special type of interference filter, which reflects a specific part of the spectrum, whilst transmitting the rest. Used in scanners to split a beam of light into RGB components. Digital: Use of binary code to record information. Information can be text in a binary code – e.g., ASCII, images in a bitmapped form, sound in a sampled digital form, or video. In the technical sense, digital describes electronic technology that generates, stores, and processes data in terms of two states: positive and non-positive. Positive is expressed or represented by the number 1 and non-positive by the number 0. Thus, data transmitted or stored with digital technology is expressed as a string of 0′s and 1′s. Each of these state digits is referred to as a bit ( and a string of bits that a computer can address individually as a group is a byte ). Prior to digital technology, electronic transmission was limited to analog technology. Digital technology is primarily used with new physical communications media, such as satellite and fiber optic transmission. Other examples of digital media include CD’s, Zip Disks, and hard drives. Generally, telephone lines transfer analog information ( sound waves ), whereas modems transfer digital information ( 1′s and 0′s ). Digital Images or Electronic Images: Computer-readable because the data has been turned into binary code ( a sequence of 1′s and 0′s = Zero’s ). Digital Reader / Printer: A device that enlarges microimages for viewing and also has the capability to produce a hard copy output of the enlarged image via the use of a CCD or CMOS – an emerging light sensor technology offered as an alternative to CCD – Charged Coupled Device – array / scanning device. The CCD or CMOS – an emerging light sensor technology offered as an alternative to CCD – Charged Coupled Device – array / scanning, digitising & imaging device produces a digital image that is capable of being sent to a dedicated digital printer – usually a laser or ink jet type and usually A 4 = 210 x 297 mm or A 3 = 297 x 420 mm in size. Digital Reader / Scanner: A device that enlarges microimages for viewing and also has the capability to produce a hard copy output of the enlarged image via the use of a CCD or CMOS – an emerging light sensor technology offered as an alternative to CCD – Charged Coupled Device – array / scanning, digitising & imaging device. The CCD or CMOS – an emerging light sensor technology offered as an alternative to CCD – Charged Coupled Device – array / scanning, digitising & imaging device produces a digital image that is capable of being sent to a digital printer – usually a laser or ink jet type or captured via a PC, either stand alone or on a computer network environment. Digi – fiche or digital to analogue microfiche or 16 / 35 mm roll film: A term used by Staude @ Staude GmbH of Germany to describe their COM – Computer Output Microfilm converter which produces chemically processed 105 x 148 mm microfiche or 16 / 35 mm roll film from digital input data in a number of raster image files such as .TIFF, .JPEG, .PDF, .DOC, .XLS, etc. in bitonal, grey scale or colour. DIN standards: DIN stands for “Deutsches Institut für Normung“, meaning “German institute for standardisation”. Direct image film: A film that will retain the same polarity as the previous version of the original material; that is tone for tone, black for black, white for white, negative for negative, or positive for positive with conventional processing. Dmax: The highest level of density of a film positive or negative. Dmin: The point of minimum density in an image or original. Document: A medium and the data recorded on it for human use, e.g. a report sheet or a book. Document preparation: Activities that must be undertaken to prepare records for filming or scanning, digitising & imaging. Activities include physical preparation such as removing staples, unfolding etc. and intellectual preparation which includes placing records in the correct order, purging records when appropriate, producing indexes, etc. Dots per inch – dpi or DPI: A measure of output device resolution and quality. For example, the number of pixels per inch on a display device. Measures the number of dots horizontally and vertically. Dry diazo process: A diazo process in which development is achieved without wetting, such as through the use of ammonia gas or chemicals incorporated in the emulsion level of the film. The encapsulated ammonia gas or chemicals is released for development of the image via a heat source, usually by heated rollers. Dry Silver Film: A non gelatin silver film that is developed by application of heat. Duplex: A method of recording on a roll microfilm, micrographic or microform in one exposure the image of the front and the back of a document. The microimage appears side by side across the width of the microfilm, micrographic or microform. Duplicate: A copy of a microform made by contact printing or by optical means. Duplicate microform: A microform created by duplicating an existing microform. Electrostatic process: The formation of a latent electrostatic image on a surface by action on a charged photoconducting material. Emulsion 1: A light sensitive layer coated onto a film substrate. The microfilm, micrographic or microform images are recorded in the emulsion layer of the microfilm, micrographic or microform. Emulsion 2: A single or multilayered coating of gelatinous material on a transparent base carrying radiant energy reactive chemical that create a latent image upon exposure. Processing techniques produce a final, visible, usable image. Enlarge: To produce in a size larger than the original or the intermediate. Envelope: A piece of folded paper, chemical inert or pH neutral, used for storing microfiche or jackets. Exposure: The act of subjecting sensitized materials to radiant energy e.g. a light source. Eyepoint 2: The position of the lens axis at which the brightest and sharpest visual image is obtained. Facsimile: An exact copy of a document; the process or the result of the process by which fixed graphic images are scanned, transmitted electronically, and produced either locally or remotely. Fading: The loss in density of photographic images. Field 2: A unit of data within a card, record etc. Film: Any sheet or strip of transparent plastic coated with a light-sensitive emulsion. Film advance 2: The length of film moved after a given exposure. Film channel: The space in a jacket into which the film is inserted. Film gate: A mechanism in cameras, readers, printers, reader / printers and scanners, projectors, or similar devices that holds the photographic film in a precise plane and limits the area of illumination at the time of exposure or projection. Film size: Film width, generally expressed in millimetres, e.g. 16, 35 or 105 mm. Fine grain: A description of film silver halide emulsions in which the grain size of silver is small; the term is relative since there is a wide variation in the grain size among various fine grain films. Fixer: A solution used to remove undeveloped silver halides from photosensitized emulsions. The fixer usually contains sodium or ammonium thiosulphate – hypo, a hardening agent and an acid or acid salt. Focus 2: To adjust the relative positions of a lens and film to obtain the sharpest possible image. Fog: Non image photographic density. 3. Wrongly stored or out dated photographic materials. Foot candle: A unit of illumination – the amount of illumination produced by a standard candle at a distance of one foot. The measure or luminous flux density falling on any surface. Fresnel lens: A lens comprised of concentric stepped rings that result in a very thin lightweight lens. Frame numbering: A number placed by most 16 mm cameras next to each image on the microfilm, micrographic or microform. Frilling: A puckering and peeling of a photographic emulsion layer from it base. Gelatin: A colloidal protein used as a medium to hold silver halide crystals in suspension in photographic emulsions, as a protective layer over emulsions, as a carrier for dyes in filters, etc. Generation: One or several of the successive stages of photographic reproduction of an original or a master. Glass flats: Two pieces of glass polished to a high degree of smoothness and even-ness used to hold film in cameras, readers, reader / printers and scanners, enlargers etc. Ghost images: Spurious multiple images of objects caused by reflection from lens surfaces in cameras etc. Grain: The discrete particles of image silver in photographs. Additional information on gray scales, resolution test targets and step wedges is available at @ Microfilm, micrographic or microform and Scanning, Digitising & Imaging Resolution Test Target and other Quality Assurance products from A&P International of the USA. Grid pattern: An array of horizontal and vertical lines – usually imaginary that divides and area of a microfilm, micrographic or microform – usually microfiche into spaces called frames. The grid defines the arrangement of the rows and columns. Gutter – Book: The combined marginal space formed by adjacent margins of any two pages of an open book. Halide: Any compound of chlorine, iodine, propane or fluorine and another element. Solver bromide, silver chloride and silver iodine are the light-sensitive materials in most silver emulsions. Hand held viewer: A small portable magnifying device used for viewing microfilm, micrographic or microform or transparencies. Hand viewer: A small portable magnifying device used for viewing microfilm, micrographic or microform or transparencies. Hard copy: A reproduction of a document usually enlarged and on paper or other material. Haze: Light scatter in film base or other essentially transparent material. Heat development: An image forming method dependent on the absorption of heat. High contrast: A relationship of image tones in which the light and dark areas are represented by extreme differences in density. High reduction: Reductions Ratios above 1:30 up to and inclusive of 1:60 or even higher e.g. 1:100. History of Microfilm: Originally developed in the 1800s, microfilm did not get put to significant use until the late 1920s. When it was first developed, banker George McCarthy held the patent for the machine capable of creating this film. The microfilm machine created permanent film copies of bank documents by using a special camera, which took pictures of documents with black and white film. The film records were able to resist deterioration and helped save storage space. The images could be viewed later through a special machine. In 1928, Eastman Kodak purchased the rights to the machine, which helped catapult it into the business market. In the 1930s, the New York Times began creating copies of their daily newspapers to store for later use. The paper used by the Times to create these copies, however, deteriorated rapidly. Therefore, the newspaper decided to switch to microfilm. After seeing their success with the process, Harvard University began an extensive recording project. This project continues today and involves copying newspapers from around the world onto microfilm, which is then stored in the library at the university. Hollerith Punch Card: The first practical use of punched cards for data processing is credited to the American inventor Herman Hollerith, who decided to use Jacquard’s punched cards to represent the data gathered for the American census of 1890, and to read and collate this data using an automatic machine. Many references state that Hollerith originally made his punched cards the same size as the dollar bills of that era, because he realized that it would be convenient and economical to buy existing office furniture, such as desks and cabinets that already contained receptacles to accommodate stacks of bills. Other sources consider this to be a popular fiction. Whatever the case, we do know that these cards were eventually standardized at 7 and 3/8 inches by 3 and 1/4 inches, and Hollerith’s many patents permitted his company – which became International Business Machines – IBM in 1924 to hold an effective monopoly on punched cards for many years. Hollerith’s early cards were punched with round holes, because his prototype machine employed cards with holes created using a tram conductor’s ticket punch. Hollerith continued to use round holes in his production machines, which effectively limited the amount of data that could be stored on each card. By the early 1900s, Hollerith’s cards supported 45 columns, where each column could be used to represent a single character or data value. This set the standard until 1924-1925, when the Remington Rand Corporation evolved a technique for doubling the amount of information that could be stored on each card. But they failed to exploit this advantage to its fullest extent, and, in 1929-1931, IBM responded by using rectangular holes, which allowed them to pack 80 columns of data onto each card. Hood: A part of the structure of a microfilm, micrographic or microform reader, reader / printer or scanner PC monitor designed to shield the screen from ambient light. Horizontal mode 2: The arrangement of images on a microfiche in which the microimage is in the top left had corner of the grid pattern and succeeding images appear in sequences from left to right and in rows from top to bottom. Humidity: The Percentage or % of moisture in the air, a higher the Percentage or % reduces the accumulation of static electricity and extending the life of photographic material that becomes brittle in excessively dry air. The reverse is true in that high humidity is a greater threat to microfilm, micrographic or microform which should be stored at a relative humidity of 30-40% and as low a temperature as 10 degrees centigrade for long term preservation so it may be necessary to remove excessive moisture from the surrounding localised air. Hybrid systems: Refers to a range of hybrid systems that include both microfilming and imaging of a document at the same time or during the single passage of the document through the multifunctional device. Several manufactures previously had hybrid units in their product ranges. Image orientation: The arrangement of images with respect to the edges of the film. Image reversing film: A film that when conventionally processed will reverse the polarity and tonal scale of the original material; that is , whites form blacks, blacks from whites, negatives from positives and positives form negatives. Jam – a film jam: A defect in a microfilm, micrographic or microform camera that appears as parts of documents followed by a dark streak on the film. This defect is associated more with output from rotary cameras. European @ 180 x 240 mm in size produced in Negative or Positive formats: Jumbo Microfiche were predominately 7 X 9 inch = 180 x 240 mm in size utilised by a number of automotive manufacturers who were predominately European but also the jumbo fiche was used to a lesser extent in the USA & later in Korea with Hyundai. Toyota @ A4 = 210 x 297 mm in size – produced in Positive Format ONLY: The Jumbo Microfiche were 8.25 X 11.75 inch = 210 x 297 mm in size & utilised by Toyota of Japan for spare parts plus pricing applications. To minimise the number of microfiche an automotive dealer had to hold Toyota combined four (4) standard 105 x 148 mm microfiche onto one Jumbo Microfiche @ A4 = 210 x 297 mm size. The purpose of this multiple format was to include specific components in one combination jumbo microfiche. Toyota worked closely with Canon Japan on this application and Canon Japan made two models of readers to suit the Toyota application. Initially the model Canon Panorama Reader model 400 was converted to accommodate the Toyota @ A4 = 210 x 297 mm size Jumbo Microfiche. The models were the Canon Canorama Reader model 400-4 ( later upgraded to the model 360-4) and the model 400-8 (later upgraded to the model 360-8 ). The designation of 400 or 360-4 equated to the Canorama Reader being able to accommodate four (4) standard 105 x 148 mm microfiche. The Canon Canorama Reader model 400 or 360-8 was unique in that the two A4 size jumbo microfiche sat one above the other and the focal length of the lens was used to focus e.g. first on the lower jumbo microfiche e.g. the spare parts catalogue and then the operator would refocus the lens to the top jumbo microfiche e.g. the price list so the operator could check on the part required from the lower jumbo microfiche and then look up the price from the corresponding related upper jumbo microfiche in one easy task – this was the reason for producing the A4 jumbo fiche in Positive Format only. If the A4 jumbo microfiche was in negative format the operator could not see through the top level jumbo microfiche to the second level jumbo microfiche. This was a very successful and widely used application for microfilm technology by Toyota. Lamp house or lamp draw: That part of an enlarger, reader, reader / printer or scanner which contains the light source e.g. lamp. Lap reader: A microfilm, micrographic or microform reader that can be placed on a persons lap during use. Leader: Clear film 24 to 36 inches = 610 to 914 mm on the front and back of the roll of microfilm, micrographic or microform to protect the images on the film. Long term – LE film: Film suitable for the preservation of records for a minimum of 100 years – e.g. Life Expectancy – LE100 when stored under proper conditions e.g. 10 degrees centigrade and 30-40% humidity, providing the original film was processed properly. Lumen: A fundamental light unit, applied to the concept of light flux – the rate of flow of light. Magnification ratio: The expression of the relative degree of enlargement by an optical instrument; usually expressed in diameters of times, e.g. 16X = 1:16, 24X = 1:24, 30X = 1:30 etc. Master: A document or microfilm, micrographic or microform from which duplicates or intermediates can be produced. Master film: Any film, but generally the camera silver halide microfilm, micrographic or microform, used to produce further reproductions, e.g. intermediates or distribution copies. Microcard - Microcards and Microprints: Microprint and microcards are opaque media, on which reduced images are printed on highly processed 100 per cent linen card stock. Special Note: There are several products available to read / view, scan / print from this material. 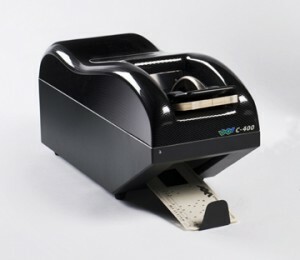 Two of the products are the ScanPro models 3000 and 2000. 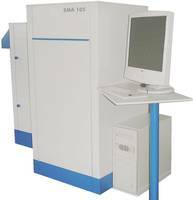 You may care to visit the Digital Scanning & Microfilm Equipment – DS & ME webpage for further details on the ScanPro 3000 features @ ScanPro 3000 – Scanner, digitiser – digitizer, Imager – to – PC Digital Microfilm Reader / Viewer Scanner, digitiser – digitizer, Imager / Printer for all microform formats. Micro Card – Micro cards and Micro prints: Microprint and microcards are opaque media, on which reduced images are printed on highly processed 100 per cent linen card stock. A reader is available for these images, but no reader / printer has been available for some time. See also: Micro-opaque or Micro Opaque/s, Microopaque/s, Micro-Opaque/s. Microfiche: A sheet of microfilm, micrographic or microform usually 105 X 148 mm = 4.13 x 5.83 inches in size containing multiple images in an X – Y grid pattern. Step & Repeat Camera produced microfiche formats are usually 98 frames for 24 X reduction ratio = 7 rows X 14 columns and for Computer Output Microfiche – COM = 270 for 48 X reduction ratio = 15 rows X 18 columns or sometimes at higher reduction ratios per microfiche or commonly known as Ultrafiche @ 1:100. Microfilm 1: Fine grain, high-resolution photographic film capable of recording images. Microfilm 2: A fine-grain film containing an image greatly reduced in size from the original or the raw film to be used for microphotographs. Microfilm 3: The process of recording microphotographs on film. Microfilm 4: A film bearing a miniature photographic copy of printed or other graphic matter, usually of a document, newspaper or book pages, etc., made for a library, archive, or the like. Microfilm 5: A strip of film of standard width on which books, newspapers, documents, etc, can be recorded in miniaturized form. Microfilm / microfiche reader: Equipment used to read microforms and whose primary components include a lens, a light source, and a viewing screen. Microfilm, micrographic or microform is normally enlarged to original size for reading. Microfilm / microfiche reader / printer: A device that enlarges microimages for viewing and also has the capability to produce a hard copy output of the enlarged image. Additional information on reader / printers is available from Digital Scanning & Microfilm Equipment – DS & ME webpage for further details on the ScanPro 3000 features @ ScanPro 3000 – Scanner, digitiser – digitizer, Imager – to – PC Digital Microfilm Reader / Viewer Scanner, digitiser – digitizer, Imager / Printer for all microform formats. Microfilm / microfiche reader scanner / printer: A device that enlarges microimages for viewing and also has the capability to produce a hard copy output of the enlarged image via the use of a CCD or CMOS – An emerging light sensor technology offered as an alternative to CCD Charged Coupled Device – array / scanning, digitising & imaging device. Additional information is available on digital microfilm, micrographic or microform / microfiche reader / scanner / printer – which are the digital alternative to the now obsolete analogue reader / printer from Digital Scanning & Microfilm Equipment – DS & ME webpage for further details on the ScanPro 3000 features @ ScanPro 3000 – Scanner, digitiser – digitizer, Imager – to – PC Digital Microfilm Reader / Viewer Scanner, digitiser – digitizer, Imager / Printer for all microform formats. In contrast the Canon models MS300, MS350, MS400, MS500 and MS800, & the Minolta now Konica-Minolta models MS2000, SP2000, MS3000, SP3000, MS6000 and MS7000, & the Kodak Microfilm models the ABR 2400 DSV and the ABR 3000 DSV, 2400DSV-E and 3000DSV-E Digital Microfilm, micrographic or microform Reader / Printer / Scanners – which are the digital alternative to the now obsolete analogue reader / printer – all require a minimum of two or more – usually 3 or 4 zoom lenses to cover the range of magnification provided by the ScanPro 3000 with its 7 x to 105 x capability. 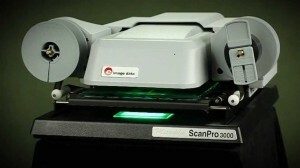 The ScanPro 3000 Imaging micrographic Reader / Printer / Scanners. No extra lenses to buy, store, lock away and manage, or have stolen by errant clients. Microfilmer: See also: Camera, Planetary camera, Rotary camera, Step-and-repeat camera. Microfilming: The techniques and processes used to record microimages on film. Microform: A form usually film, that contains microimages. See also: Aperture card; jackets; Microfiche; Roll film; Ultrafiche. Microimage: An image of information too small to be read without magnification. Micro Opaque / s, Microopaque / s, or Micro-Opaque / s 1: A very small image at 24x, 48x or up to 100x reduction ratio on a white reflective card material usually in a 6 X 9 inch or and 3 X 5 inch size and produced via a photographic or printing process on highly processed 100 per cent linen card stock as opposed to a transparent film base of silver, vesicular or diazo film, viewed by reflection rather than projection. Micro Opaque / s, Microopaque / s, or Micro-Opaque / s 2: A nontransparent base material (usually high gloss white in colour) with highly reduced reproductions arranged in rows and columns. Micro Opaque / s, Microopaque / s, Micro-Opaque / s material is from a past era and although an obsolete micro – format it is till available for viewing and now scanning & printing in many University Libraries. 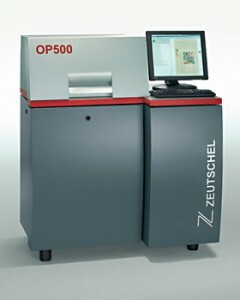 In recent times two manufacturers have seen the need to scan / print from these Microcard, Microprint, and Micro Opaque / s, Microopaque / s, Micro-Opaque / s materials. Microphotography: An application of photographic techniques to produce images smaller than the original material. Microprint – Microprint and Microcards: Microprint and microcards are opaque media, on which reduced images are printed on highly processed 100 per cent linen card stock. A reader is available for these images, but no reader / printer has been available for some time. Micropublishing: To issue new – not previously published or reformatted information in microform for sale or distribution. Mil: One one-thousandth 0.001 of an inch, often used as a measure of thickness of film base, emulsion coatings, magnetic tape etc. Mil Spec: An abbreviation for Military Specification – Filming to government or military filming standards. Mirror image 1: Characterising a reversal of orientation, as the image of an object formed by a plane reflecting surface. Right to left change, as seen in a flat mirror. Mirror image 2: the reversed object as seen in a mirror. Multiplex: A method of recording images on film so that there are two of more rows of images across the width of the film. This sequence results in the first image in one row being opposite the first image in the other row or rows. Negative – appearing image: A photographic image with light lines, characters and neutral tones on a dark background. Nitrate film: The first successful, flexible and transparent film base. First made in 1889, and used in the manufacture of most professional 35 mm film up to 1951. Cellulose nitrate became the first film support because it was the oldest known and best understood plastic; it was also relatively easy to make and well researched due to its use in smokeless gunpowder. The fire hazards in the handling of this material were, and still are, considerable. It has now been replaced by various types of low in flammability safety base. These have included cellulose Diacetate, triacetate and Polyester based film. Non-unitised microfilm: Microforms that contain unrelated information units, for example, roll film can be non-unitised, since it can contain a variety of unrelated information units on the same roll. Notch: A cut-out in either the top or the bottom edge of the microform – microfiche, jackets that is used for indexing, coding or retrieval. Opaque screen or front projection screen: A reader, reader / printer or scanner screen of opaque material on which an image is projected. This projection process is often referred to as front projection as against rear projection for a translucent screen. Out of focus: As applied to an image that is not sharp because of the lens, film, planes, and object are not in the correct relative position. pH: A measure of the acidity of alkalinity of chemical substances, expressed as the logarithm of the reciprocal of the hydrogen ion concentration. Planetary camera: A type of camera consisting of a camera head – with the film, lights, and a copy board. Documents are placed under the camera head and filmed while lying flat on the copy board. The document being filmed and the film in the camera remain in a stationary position during the exposure process. Original camera film normally has a negative polarity. Includes the change or retention of the dark to light relationship of an image, that is, a first-generation camera negative to a second-generation positive indicates a change in polarity, while a first-generation negative to a second-generation negative indicates that polarity is maintained. Polyester: A transparent plastic made from polyesters and used as a film base because of its dimensional stability, strength, resistance to tearing, and relative non- flammability. Positive – appearing image: An image in which the lines and character appear dark against a light background. Processing: A series of steps involved in the treatment of exposed photographic material to make a latent image visible and ultimately usable, e.g. development, fixing, washing, and drying. Quick thread take-up spool or reel: The device used to wind up film in a reader, reader / printer, scanner / printer or viewer scanner / printer after it has been viewed ; also called a receiving or take-up spool or reel. Reader – Aperture Card with 35 mm microfilm format: A device or equipment used to read Aperture Cards in usually 35 mm microfilm format mounted in an IBM punch card and whose primary components include a lens, a light source, and a viewing screen usually A3 = 297 X 420 MM, OR A2 = 420 X 594 MM or even A1 = 594 X 841 MM in size. Reader – Microfiche: A device or equipment used to read microforms in microfiche or jacket format and whose primary components include a lens, a light source, and a viewing screen usually A4 210 X 297 mm or Computer Printout 11 x 14 inch in size. Microfiche, microfilm, micrographic or microform is normally enlarged to its original size for reading. Reader – Microfilm 16 / 35 mm in rolls or cartridges: A device or equipment used to read microforms in 16 or 35 mm roll film format and whose primary components include a lens, a light source, and a viewing screen usually A4 210 X 297 mm or Computer Printout 11 x 14 inch in size in either a manual or motorised carrier for the movement of the 100 ft. = 33.5 metre rolls of microfilm. Microfilm, micrographic or microform is normally enlarged to its original size for reading. Reader / printer: A device that enlarges microimages for viewing and also has the capability to produce a hard copy output of the enlarged image. The earliest reader printers from both Bell & Howell and Kodak Microfilm used a photographic process and material and then to develop the images – in the case of Bell & Howell external to the unit and with the Kodak Microfilm model 1824 via a chemical bath built into the machine. 4. In the mid 1980′s to the plain paper Xerographic process with the release of the Canon model NP580 microfilm, micrographic or microform / microfiche / aperture card input with A3/A4 output reader printer. Reader / printer – wet – electrostatic paper type: A device that enlarges microimages for viewing and also has the capability to produce a hard copy output of the enlarged image. In this instance the type of paper used for printing purposes is zinc oxide coated paper with the image developed via emersion in a mix of a liquid petroleum carrier and a black carbon slurry of liquid toner. Various manufactures were active in the manufacture and marketing of this type of reader printer in the 1960′s through to the mid 1980′s. Manufactures included Canon with their models CP370 & CP380, Minolta – now Konica-Minolta with their models RP405 & RP407, Bell & Howell with their Spacemaster and ABR range of units and in the engineering area names like Imtec of the UK, OCE of the Netherlands, Ricoh of Japan, Schaut, Zeutschel and others from Germany and 3M with a wet process silver paper were the prominent players in this engineering drawing, maps & plans market area with prints from A3 to A0 in size. 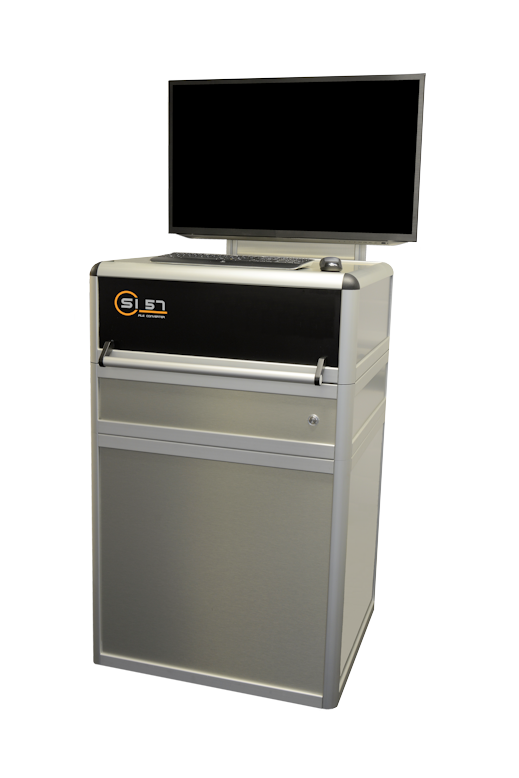 Reader / printer – dry cold pressure fuse – electrostatic paper type: A device that enlarges microimages for viewing and also has the capability to produce a hard copy output of the enlarged image. In this instance the type of paper used for printing purposes is zinc oxide coated paper with the image developed via passing the paper with the dry mix of black carbon and plastic granules through two cold rollers under extreme pressure. This pressure from the rollers caused the dry toner and plastic particle mix to adhere itself to the zinc oxide coated paper. Various manufactures were active in the manufacture and marketing of this type of reader printer in the mid 1980′s. Manufactures included Fuji of Japan with their models FMRP40 with A4 image screen and output mainly for microfiche and jacket applications and the FMRP30 with A3 output prints for use with 35 mm roll film in a Library – Public, Special Purpose, University & Reference environment and also for aperture cards in the engineering drawing, map & plan area. This dry pressure fusing process was a giant leap forward in copy quality and also aesthetic acceptability with no washing lines required to dry the prints and the feel and smell of the liquid petroleum based carrier and toner were eliminated. Bell & Howell and Xidex in America and others internationally had a range of units with the dry cold fuse process but Fuji units were by far the superior unit in this field. Minolta – now Konica-Minolta to my knowledge never produced a dry cold fusion type unit and moved directly from the wet electrostatic type of their RP405 & RP407 units to the plain paper Xerographic process with their models RP502, RP503, RP504, RP505, RP507 and RP509 a4 through A2 Plain Paper Output Units in the 1980’s. Reader / printer – plain paper – Xerographic process type: A device that enlarges microimages for viewing and also has the capability to produce a hard copy output of the enlarged image. In the early to mid 1980′s Canon released the model NP580 microfiche A3/A4 output Reader Printer – with the ability to print from negative film only as it had no ability to reverse the process and supply a positive paper print from a positive microfilm, micrographic or microform. with a replaceable toner cartridge including the copier drum which was able to print from either negative or positive microfiche – by changing the toner cartridge in the unit from a negative to a positive cartridge producing a positive paper print. Shortly after release Canon added a 16 mm manual roll film carrier for the PC70. and the RP509 with A2 print output. 3M entered the plain paper era with the release of their engineering drawing, map & plan plain paper units the model 630 mainly for aperture cards which was made in Japan by KIP and rebadged for 3M. 3M also produced two high production Quantimatic range of units again for 35 mm aperture card and engineering drawing, map & plan applications. One Quantimatic had an A2 print output and the second had A1 print output. Minolta – now Konica-Minolta then released its updated range of analogue reader printers and the last fling before the digital era the RP600Z, RP603Z, RP605Z, RP606Z, RP607Z AND RP609Z all with zoom lenses and ranging in output from A4 with the RP600Z, RP603Z, RP605Z, RP606Z then A3/A4 with the RP607Z and A2/A3/A4 with the RP609Z unit. which were all A3 image screen and A3 / A4 output units and the last of the Canon analogue range of reader printers. Reader / scanner: A device that enlarges microimages for viewing and also has the capability to produce a hard copy output of the enlarged image via the use of a CCD or CMOS – An emerging light sensor technology offered as an alternative to CCD – Charged Coupled Device – array / scanning, digitising & imaging device via a digital process via a PC – and thus to a LAN or WAN or to a dedicated printer. The CCD or CMOS – An emerging light sensor technology offered as an alternative to CCD – Charged Coupled Device – array / scanning, digitising & imaging device produces a digital image that is capable of being sent to a digital printer – usually a laser or ink jet type and usually A4 = 210 x 297 mm or A3 = 297 x 420 mm in size or captured via a PC, either stand alone or on a computer network environment. Additional information is available on digital microfilm, micrographic or microform / microfiche reader / scanner / printers – which are the digital alternative to the now obsolete analogue reader / printer is available from Digital Scanning & Microfilm Equipment – DS & MEwebpage for further details on the ScanPro 3000 features @ ScanPro 3000 – Scanner, digitiser – digitizer, Imager – to – PC Digital Microfilm Reader / Viewer Scanner, digitiser – digitizer, Imager / Printer for all microform formats. The ScanPro models 3000 – 2000 – 1100 have no lenses to change, the ScanPro models 3000 – 2000 – 1100 are built zoom lens with a magnification range from 7 x to 105 x.
usually 3 or 4 zoom lenses to cover the range of magnification provided by the 1100 with built in zoom lens with a magnification range from 7 x to 105 x capability. 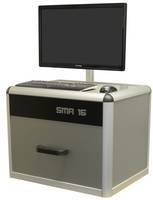 The 1100 are Imaging micrographic Reader / Printer / Scanners. In the scanner printer market Canon has produced a number of models starting with the DMP100 in the early 1990′s – Canon’s first digital microfilm, micrographic or microform offering – which are the digital alternative to the now obsolete analogue reader / printer followed many years later by the MS400 and MS500 all with A4 image screens followed by the MS800 with a A3 image screen and A3/A4 laser printer plus the ability to connect to a PC or LAN or even a WAN. Canon later introduced the models MS300 and the MS350 to replace the MS400 and MS 500 units. Minolta – now Konica-Minolta followed much later after the release of the Canon model DMP100 in the early 1990′s and after the release of the Canon MS400 and MS500 units with their MS2000 and SP2000 with an A4 image screen and print output and the MS3000 and SP3000 with an A3 image screen and A3/A4 print output. Most other suppliers rebadged either the Canon or Minolta now Konica-Minolta units e.g. Kodak Microfilm with their ABR 2400 DSV and the ABR 3000 DSV, 2400DSV-E and 3000DSV-E Digital Scanner-Printer units which have A4 and A3 screens and print outputs respectively. Reduction: A reproduction smaller than the master, expressed as the number of times a given linear dimension of an object is reduced, e.g., 16x or 16:1or 16 to 1. Reduction ratio: Is how many times a document is reduced in size during microfilming and expressed as a numerical value which equates to the dimensions of the original or master and the corresponding dimension of the microimage. A reduction radio of 24 x means the document was reduced 24 times or a ratio of 24:1 during microfilming. Reel or spool: A flanged holder on which processed microfilm, micrographic or microform is wound; designed to be inserted into readers, reader / printers, scanner / printers and viewer scanner / printers and other retrieval devices. 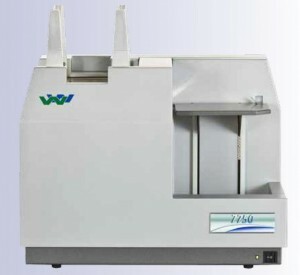 Residual thiosulphate test: A test used to measure chemical residue left on microfilm, micrographic or microform after processing. One of the testing processes is the Methylene Blue Test. Resolution: The ability of optical systems and photographic materials to render visible fine detail of an object; a measure of sharpness of an image, expressed as the number of lines per millimetre, discernible in an image. Resolution test target: A target used to read resolution of each roll of microfilm, micrographic or microform. The target must comply with the American National Standards Institute standard published as ANSI/AIIM MS51. Additional information on resolution test targets and step wedges is available at @ Microfilm, micrographic or microform and Scanning, Digitising & Imaging Resolution Test Target and other Quality Assurance products from A&P International of the USA. 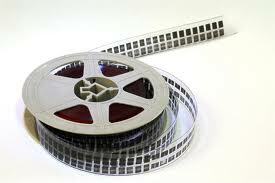 Rollfilm: microfilm, micrographic or microform that can be placed on a reel, spool or core. Rotary camera: A camera into which documents are fed and the documents and the film move simultaneously similarly to the way a photocopy machine operates. These cameras are used for high speed filming that produces lower quality microfilm, micrographic or microform than produced on planetary cameras. Serialised microforms: Microfilm, micrographic or microform where images are stored sequentially on a roll. Silver film: A photographic film containing photosensitive compounds suspended in a suitable material. When developed, the image consists of metallic silver. Specification: A written document that details the technical requirements for a microfilming or other project. Splice: A joint made by welding two pieces of film together so they will function as a single piece when passing through a microfilm, micrographic or microform reader, reader / printer or other device. 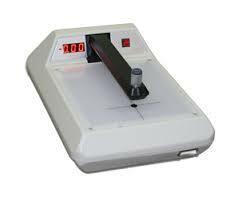 Splicing is used to correct errors and should only be done in the clear leader at the beginning of the roll of film. Spool or reel: The device used to wind up film in a camera or processor after it has been exposed; also called a receiving or take-up spool or reel. Step Test 1: A series of orderly varied exposures made to determine the optimum exposure of either film or paper prints. 2. To test for contrast for latitude, a step tablet is used in a single exposure. Test frame: A microfilm, micrographic or microform image of a test target used to check microfilm, micrographic or microform quality. Threading: The action of transferring the leading edge of the film from the supply spool or reel, cartridge etc into photographic or micrographic equipment. The threading path may go around all idlers, rollers, sprockets, etc through to the take-up device of the particular equipment. TIFF Image File Format: The Tagged Image File Format ( TIFF ) was designed from the ground up to alleviate the problems associated with fixed file formats. The key word here is designed. TIFF did not evolve from a de-facto standard. It was created to become the industry standard for image-file exchange. TIFF was a super-set of all existing graphics or image file formats. TIFF incorporates enough flexibility to eliminate the need or justification for proprietary image file formats. As a matter of fact, it is possible to store proprietary information in a TIFF file without violating the intent of the format. A. Extendibility. This is the ability to add new image types without invalidating older types and to add new informational fields to the format without impacting the ability of older applications to read the image files. B. Portability. TIFF was designed to be independent of the hardware platform and the operating system on which it executes. TIFF makes very few demands upon its operating environment. TIFF should (and does) perform equally well in both the “IBM PC” and Apple Macintosh’s environments — and UNIX. C. Revisability. TIFF was designed not only to be an efficient medium for exchanging image information but also to be usable as a native internal data format for image editing applications. Trailer: That portion of the film beyond the last images recorded. Translucent screen or rear projection screen: A reader, reader / printer or scanner screen made of treated glass or plastic onto which an image is projected, usual from the rear of the screen. This projection process is often referred to as rear projection as against front projection for an opaque screen. Transparency: An image on a transparent base that may be viewed by transmitted light or used to make copies. Ultrafiche: A microfiche with images reduced more that 90:1 = 90X reduction and sometimes up to 150:1 = 150X reduction. Underexposure: Insufficient exposure of sensitised material due to insufficient illumination, too short an exposure time, too small a lens aperture, or the improper response of an exposure control device. 2. To microfilm, micrographic or microform on one or more microfiche a unit of information, e.g. a report, case file, personnel file, specification, periodical or newspaper etc. Unitised microforms: Images are cut or created in units and are housed in jackets or are created as original microfiche. Often used in case file applications because each individual case file can be contained on one or more microfiche. 2: The arrangement of images on a microfiche in which the first microimage is located at the top left hand corner of the grid pattern and succeeding images appear in sequence from top to bottom and in columns from left to right. Vesicular microfilm: A film in which the light-sensitive component is suspended in a plastic layer. On exposure the component creates optical vesicles – bubbles in the layer. These imperfections form the latent image. The latent image becomes visual and permanent by heating the plastic layer and then allowing it to cool. Vesicular film has a grey colour in appearance. When placed in a viewer it provides a positive image to the eye. Vesicular duplicating film is a SIGN-REVERSING film e.g. a negative master provides a positive duplicate. Vesicular microfilm duplication: This process uses vesicular duplicate microfilm, micrographic or microform to create user copies of original master or intermediate microfilm, micrographic or microform. This vesicular duplicating film is sometimes preferred because duplication process does not require the use of chemicals and tends to be more durable that duplicate silver halide film which has a softer emulsion layer. Viewer / scanner: A device that enlarges microimages for viewing and also has the capability to produce a hard copy output of the enlarged image via the use of a CCD or CMOS – An emerging light sensor technology offered as an alternative to CCD – Charged Coupled Device – array / scanning, digitising & imaging device via a digital process via a PC – and thus to a LAN or WAN or to a dedicated printer. For any form of microfilm aperture card, jacket, microfiche, microfilm – 16 / 35 mm Roll, micrographic & microform requirements, no matter how small or complex, please contact us via the Contact Us @ DS & ME facility at this website or email Laurie Varendorff of Digital Scanning & Microfilm Equipment – DS & ME at Email: Laurie Varendorff & we will do everything in our power to fulfil your requirements. For any book, archival document or fragile material project which requires Scanning, Digitising = Digitizing, & or Imaging, no matter how small or large then contact Laurie Varendorff via email @ Laurie Varendorff ARMA; or Phone: Australia @ 0417 094 147 0417 094 147 – International @ +61 417 094 147 +61 417 094 147 at Digital Scanning & Microfilm Equipment – DS & ME. Laurie will be able to advise if DS & ME has the specialised equipment available for the Scanning, Digitising, & or Imaging for your project from a minimum size of A6 = 148 mm in width by 105 mm in height up to a maximum size of DOUBLE A0 or 2,540 mm in width x 915 mm in height = ( 100 x 36 inches ) for fragile documents, maps, plans or drawings or books required to meet a prospective client’s individual requirements.